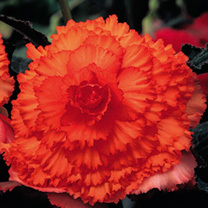 Our superb collection of Begonia tubers are supplied from the renowned Gent nursery of Arnold Van Peteghem who has been creating the very best new hybrid strains of begonias for more than a quarter of a century. 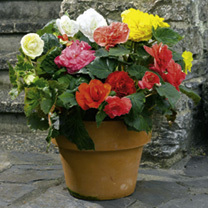 Your Begonia tubers will bloom much larger and more brightly coloured and are borne on extra strong stems making the plants more weather resistant. 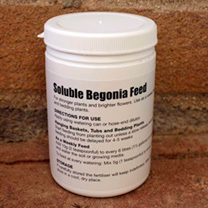 Begonia plants will flower July-October. 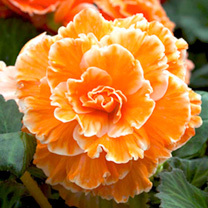 There are plenty of Begonia tubers which you will want to grow such as the vivid Sugardip, frilled prima Donna, cascading Expresso and even the high-blooming Sensation Picotee variety. Browse our range of Begonia tubers and plant something different today – we also stock a fine selection of accessories to get the best from your Begonia plants. 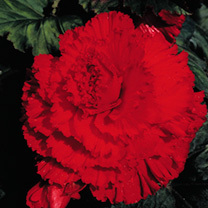 View our range of established begonia plant plants here - Quality guaranteed! 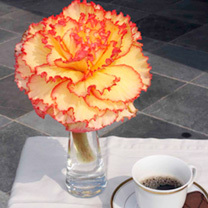 With their asymmetrical leaves, begonias in bloom grow round and full. Begonia tubers have both male and female flowers on the same plant ( the female flowers are recognisable by the triangular thickiening under the bloom). 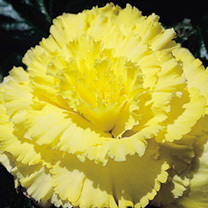 Some varieties boast bright, garish colours, others subtle pastel tints. 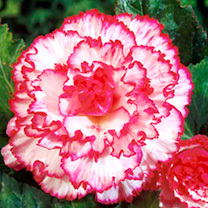 Some varieties boast bright, garish colours, others subtle pastel tints. Some are deliciousley fragrant. Their flowers are resistant to both wet weather and heat. They are durable and long-lasting, blooming all summer and right up to first frosts. Some will bloom non-stop all year round. 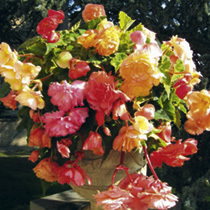 Begonias are easy to care for and require no dead heading. Many begonias boast not only beautiful flowers but attractive foliage too. 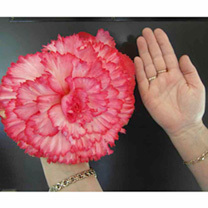 Encourage tuberous begonias to concentrate all their energy into producing big blooms by removing the female flowers with finger scissors or secateurs. These form on either side of a central male flower - you can tell the difference between the flowers by the winged seed capsule, which only forms at the base of female flowers only. Tie stems to thin canes just under the weight of unfolding blooms. continue to feed weekly with a high potash fertiliser. 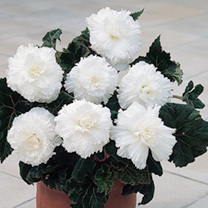 It makes a big difference to varieties like our begonia parisienne.